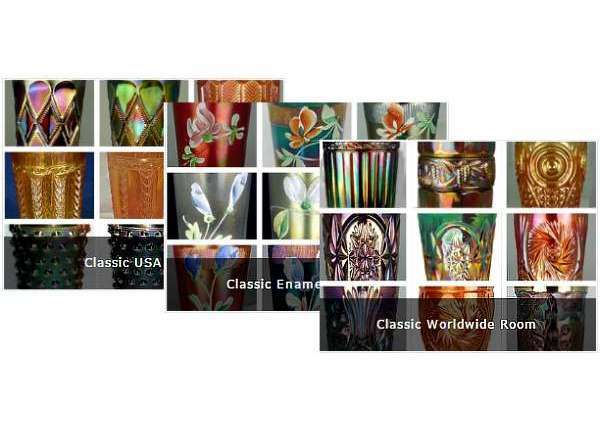 Working together, our two websites - Carnival Glass Showcase and Carnival Glass Worldwide (the links are at the end of this update) - are now actively putting Bob's wonderful tumbler collection on display for all to see. The tumbler exhibits are brought to life with fascinating stories and special featured items. Your "virtual museum" experience is designed to be a journey combining beauty, personal memories and knowledge - a Carnival Adventure like no other. Our personal adventure with Bob began in 1997, in an earlier format of NetworK when it was issued as a printed journal, but more of this later. Just like a regular museum, The Bob Smith Carnival Tumbler Museum has separate Wings, displaying Classic / Vintage tumblers, Depression Era & Late tumblers, and Contemporary USA tumblers. Each Wing takes visitors into Display Rooms and Galleries where you can browse the featured exhibits and the photo galleries. Uniquely, the Museum also features compelling and personal stories behind some of the spotlighted tumblers. They make for a great read! Thought-provoking and fascinating, you can find them on Carnival Glass Showcase! ​The Museum not only contains images of tumblers, including many rare and unusual items, it also offers fascinating history, research and catalogue images, uniquely personal stories and memories that will make you gasp, will make you smile and may even make you cry. All in the comfort and convenience of your browser. It’s definitely not a requirement! You don’t have to be a tumbler collector to visit and enjoy the Tumbler Museum. All collectors of Carnival and other glass will enjoy the beauty, the passion and the stories. But there’s more, so much more, on both partner websites of the Museum. It would be wrong to think that Bob Smith is “just” a tumbler collector – he is also an enthusiastic and resourceful glass researcher. It was almost 20 years ago when in our printed NetworK #14, we published an article called “Bazaars, Bangles & Beaded Spears”. The Indian Fish vase on the cover of that NetworK (shown right) hinted about the contents to be revealed inside. The article was a record of Bob’s “Carnival Glass Trek of a Lifetime” which included a visit to India and the start of many discoveries. This was the very first time that information on Carnival Glass made in India was published – leading to the identification and recording of many distinct and highly unusual tumbler designs. And it was all thanks to Bob Smith. How did Carnival Glass makers decide which pattern to use on which shape? Some patterns are found in a whole range of shapes (Northwood’s Grape and Cable comes immediately to mind), but some patterns are only known in tumblers (usually part of a water set). Conversely, some patterns are not known in the tumbler shape. So here is the challenge: help us to document the Carnival patterns that are only known in the tumbler (or tumbler plus pitcher) shape, and the Carnival patterns that are not known in the tumbler shape. Answers by email please, and we’ll include them in a section on the Museum that is coming soon. Do you have a Carnival tumbler story? We know there are many collectors out there who love tumblers. If you have a story to tell, why not share it with us? We would love to hear from you and have your feedback! Again, please email us (email address is in the footer). There's no waiting in line for admission, no entry charges and no limit on how many times you can visit. 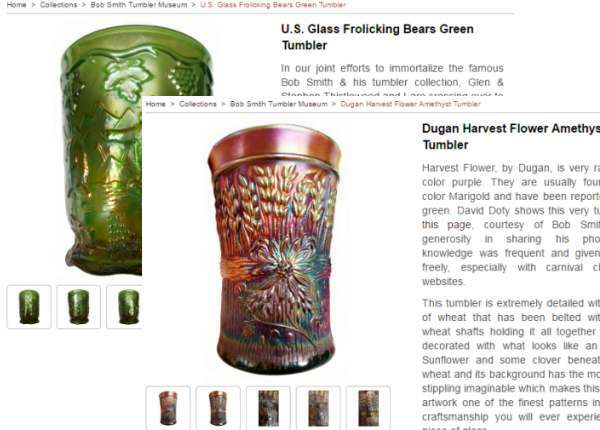 Just click on the images below to visit Bob's Tumbler Museum on Carnival Glass Showcase and on Carnival Glass Worldwide.